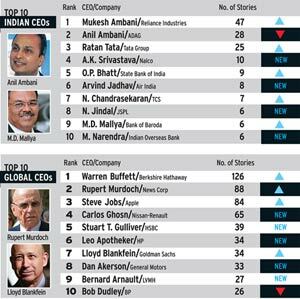 Mukesh Ambani was the most tracked CEO in March. Reliance Industries's blockbuster $7.2-billion oil and gas alliance with BP kept the senior Ambani in the limelight. The pink papers saw Ambani as an "avid deal maker" given the spate of deals announced by RIL recently - from the joint venture with Atlas Energy in the US for shale gas to the BP deal. Ambani also won accolades for his growing global stature. His appointment as Director on the board of Bank of America - the first non-American - and his 34th rank on Forbes World's Most Powerful People List of 2011 also got extensive coverage in the media. Will the crisis in Japan weigh down stocks in Asia?